Why are my incoming mail delayed? In general, Nine uses background services to get new email messages or updated information. 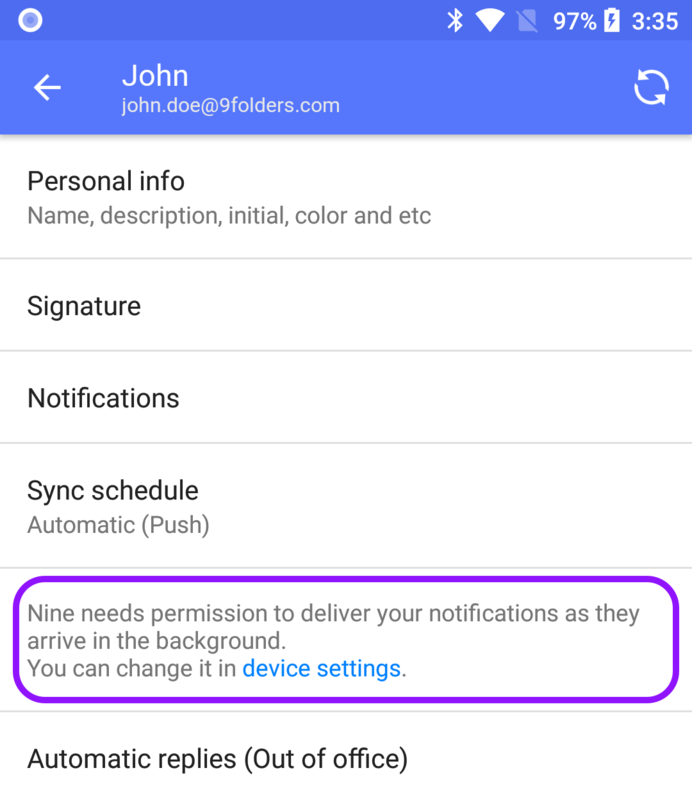 Restricting background services on Android may cause significant delay in receiving email messages or slower synchronization. Please check out the following if this happens on your device. The Doze feature has been added to restrict background services on the Android 6 and 7. Once you leave the device unused for a while, it will be in the Doze state after a certain period of time and the network usage will be restricted as well. For this reason, this causes delay in receiving email messages. If you want to fix the problem, you should turn off the battery optimization option. Please refer to the below method for each device. In case of Xiaomi devices that use MIUI, you can see separate settings that restrict background services. Please refer to this section to enable the limited settings. If you use v4.0 or above, you can check your battery optimization state in Nine settings. If you still have this issue, please send us a log file on Nine. We will review a log file you sent and give you an answer as soon as we analyze it.